This post has 13,260 views. Step 1: Create a new document. Step 2: Make sure that you have a dark grey or black as you foreground colour. Using the paint brush tool, choose a brush with 100% hardness and appropriate size to paint the shape you want. 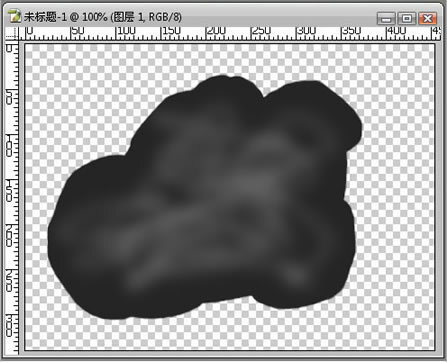 You can see here I just painted a random shape. Step 3: Pick the dodge tool, and pick a round brush with 0% hardness and brush randomly on your shape so there are some lighter areas. Step 4: Now select your shape by holding down the Ctrl key and clicking on the base layer (since we only have one layer at this point). Go to Filters–>Liquefy, and move your mouse in a circular motion to swirl the different shades of grey together. Step 5: Go to Filters–>Artistic Effects–>Plastic Wrap. You?ll get something like the picture below. You may want to experiment with the settings a bit to get the look you want. Step 6: Here?s the final step. Click on Image–>Adjustment–>Hue and Saturation (or just press Ctrl+U to bring it up). Check the “colourize” box and put the Saturation slider to maximum. Now play with the Hue slider to get your desired colour. For this example I picked the classic slime green. And there you go, you made some slime! Alternatively, you can skip step 4 and the slime you end up with it is a little less detailed, but a bit more “gooey” looking as shown by the picture below. You can be the judge as to which method is better. Finally, thank you for visiting and reading this tutorial. Great tutorial. It was so easy and helped me a lot. Good job! !